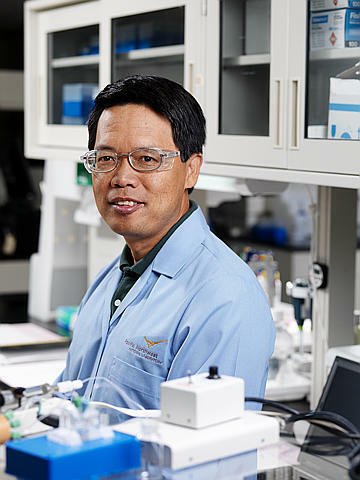 Dr. Yuehe Lin joined Pacific Northwest National Laboratory in 1997 as a Research Scientist and was promoted to Senior Research Scientist in 2000 and Chief Scientist in 2004. In 2008, he was named a Laboratory Fellow, the highest rank that PNNL scientist can attain. Recently, Dr. Lin assumed a joint position at Washington State University and PNNL. In this joint position, he continues to be a Laboratory Fellow at PNNL and is a full-professor at WSU. He has been actively working in the nanotechnology area, particularly in the development of new nanobioelectronic devices and nanomaterials for biomedical diagnosis and drug delivery. His other research activities include developing integrated microanalytical systems for environmental and biomedical analysis, and synthesizing functional nanomaterials for energy and environmental applications. Lin is the editor of the Handbook of Electrochemical Nanotechnology and one of the section editors of Encyclopedia of Microfluidics and Nanofluidics. He also serves as the associate editor for the Journal of Nanoscience and Nanotechnology and Member of Editorial Advisory Board of 20 international journals. Lin has over 10 patents. Half of the patents have been licensed to industrial partners for commercialization. Lin has about 360 publications. His publications have been widely cited in scientific community, with a total citation number ~ 25,600 and a H-index of 85. He is listed as an ISI Highly Cited Researcher (Chemistry) in 2014 and 2015. University of Idaho, Moscow, ID	Ph.D.
Xiamen University, Xiamen, China Ph.D.
Peking University, Beijing, China B.S. Tang Z., S. He, H. Pei, D. Du, C. Fan, and Y. Lin. 2014. "Graphene-Based Optical Biosensors and Imaging." In Biosensors Based on Nanomaterials and Nanodevices, edited by J Li and N Wu. 93-110. Boca Raton, Florida:CRC Press. PNNL-SA-94731. Aryal U.K., C.T. Lin, J. Kim, T.H. Heibeck, J. Wang, W. Qian, and Y. Lin. 2012. "Identification of phosphorylated butyrylcholinesterase in human plasma using immunoaffinity purification and mass spectrometry." Analytica Chimica Acta 723. PNNL-SA-83170. Yantasee W., Y. Lin, and G.E. Fryxell. 2012. "Electrochemical Sensors Based on Nanomaterials for Environmental Monitoring." In Environmental Applications of Nanomaterials: Synthesis, Sorbents And Sensors, edited by GE Fryxell and G Cao. 523-559. London:2nd ed. Imperial College Press. PNNL-SA-94792. Zhang L., L. Long, W. Zhang, D. Du, and Y. Lin. 2012. "Study of Inhibition, Reactivation and Aging Processes of Pesticides Using Graphene Nanosheets/Gold Nanoparticles-Based Acetylcholinesterase Biosensor." Electroanalysis 24, no. 8:1745-1750. PNNL-SA-89361. Zou Z., J. Wang, H. Wang, Y.Q. Li, and Y. Lin. 2012. "An integrated electrochemical device based on immunochromatographic test strip and enzyme labels for sensitive detection of disease-related biomarkers." Talanta 94. PNNL-SA-87212. Fu Z., G. Shao, J. Wang, D. Lu, W. Wang, and Y. Lin. 2011. "Microfabricated Renewable Beads-Trapping/Releasing Flow Cell for Rapid Antigen-Antibody Reaction in Chemiluminescent Immunoassay." Analytical Chemistry 83, no. 7:2685-2690. PNNL-SA-76859. Li Z., Y. Wang, D. Du, Z. Tang, J. Wang, and Y. Lin. 2011. "Functionalization of Graphene and Graphene Oxide for Biosensing and Imaging." In 11th IEEE International Conference on Nanotechnology (IEEE-NANO), August 15-18, 2011, Portland, Oregon, 612-616. Piscataway, New Jersey:Institute of Electrical and Electronics Engineers. PNNL-SA-81910. Zhang S., Y. Shao, H. Liao, J. Liu, I.A. Aksay, G. Yin, and Y. Lin. 2011. "Graphene decorated with PtAu alloy nanoparticles: facile synthesis and promising application for formic acid oxidation." Chemistry of Materials 23, no. 5:1079-1081. PNNL-SA-76972. Du D., W. Chen, W. Zhang, D. Liu, H. Li, and Y. Lin. 2010. "Covalent Coupling of Organophosphorus Hydrolase Loaded Quantum Dots to Carbon Nanotube/Au Nanocomposite for Enhanced Detection of Methyl Parathion." Biosensors and Bioelectronics 25, no. 6:1370-1375. PNNL-SA-69507. Kang X., J. Wang, H. Wu, J. Liu, I.A. Aksay, and Y. Lin. 2010. "A graphene-based electrochemical sensor for sensitive detection of paracetamol." Talanta 81, no. 3:754-759. PNNL-SA-71976. Liu G., X. Mao, A. Gurung, M. Baloda, Y. Lin, and Y. He. 2010. "Nanomaterial-Based Electrochemical Biosensors and Bioassays." In Trace Analysis with Nanomaterials, edited by DT Pierce and JX Zhao. 61-88. Weinheim:Wiley-VCH. PNNL-SA-75239. Punckt C., M.A. Pope, J. Liu, Y. Lin, and I.A. Aksay. 2010. "Electrochemical Performance of Graphene as Effected by Electrode Porosity and Graphene Functionalization." Electroanalysis 22, no. 23:2834-2841. PNNL-SA-79068. Shao Y., J. Wang, M.H. Engelhard, C.M. Wang, and Y. Lin. 2010. "Facile and controllable electrochemical reduction of graphene oxide and its applications." Journal of Materials Chemistry 20, no. 4:743-748. PNNL-SA-67720. Shao Y., S. Zhang, R. Kou, X. Wang, C.M. Wang, S. Dai, and S. Dai, et al. 2010. "Noncovalently functionalized graphitic mesoporous carbon as a stable support of Pt nanoparticles for oxygen reduction." Journal of Power Sources 195, no. 7 SP ISS:1805-1811. PNNL-SA-67641. Shao Y., X. Wang, M.H. Engelhard, C.M. Wang, S. Dai, S. Dai, and J. Liu, et al. 2010. "Nitrogen-doped mesoporous carbon for energy storage in vanadium redox flow batteries." Journal of Power Sources 195, no. 13:4375-4379. PNNL-SA-70343. Tang Z., H. Wu, D. Du, J. Wang, H. Wang, W. Qian, and D.J. Bigelow, et al. 2010. "Sensitive Immunoassays of Nitrated Fibrinogen in Human Biofluids." Talanta 81, no. 4-5:1662-1669. PNNL-SA-71863. Wang Y., Y. Shao, D.W. Matson, J. Li, and Y. Lin. 2010. "Nitrogen-Doped Graphene and its Application in Electrochemical Biosensing." ACS Nano 4, no. 4:1790-1798. PNNL-SA-71435. Zhang X., H. Li, X. Cui, and Y. Lin. 2010. "Graphene/TiO2 Nanocomposites: Synthesis, Characterization and Application in Hydrogen Evolution from Water Photocatalytic Splitting." Journal of Materials Chemistry 20, no. 14:2801-2806. PNNL-SA-70302. Zhao N., Y. He, X. Mao, Y. Sun, X. Zhang, C. Li, and Y. Lin, et al. 2010. "Electrochemical assay of active prostate-specific antigen (PSA) using ferrocene-functionalized peptide probes." Electrochemistry Communications 12, no. 3:471-474. PNNL-SA-71460. Fryxell G.E., Y. Lin, and W. Yantasee. 2009. "Electrochemical Sensors: Functionalized Silica." In Dekker Encyclopedia of Nanoscience and Nanotechnology, edited by CI Contescu and K Putyera. 1196-1206. New York, New York:2nd ed. Taylor and Francis. PNNL-SA-94702. Kang X., J. Wang, Z. Tang, H. Wu, and Y. Lin. 2009. "Direct electrochemistry and electrocatalysis of horseradish peroxidase immobilized in hybrid organic-inorganic film of chitosan/sol-gel/carbon nanotubes." Talanta 78, no. 1:120-125. PNNL-SA-63346. Kou R., Y. Shao, D. Wang, M.H. Engelhard, J. Kwak, J. Wang, and V.V. Viswanathan, et al. 2009. "Enhanced Activity and Stability of Pt catalysts on Functionalized Graphene Sheets for Electrocatalytic Oxygen Reduction." Electrochemistry Communications 11, no. 5:954-957. PNNL-SA-64809. Li J., and Y. Lin. 2009. "Nanomaterials for Sensing and Electrocatalysis." Journal of Nanoscience and Nanotechnology 9, no. 4:2173-2174. PNNL-SA-64819. Li Z., X. Cui, and Y. Lin. 2009. "Electrochemically synthesized ordered TiO2 and platinum nanocomposite electrode: preparation, characterization, and application to photoelectrocatalytic methanol oxidation." Journal of Nanoscience and Nanotechnology 9, no. 4:2297-2302. PNNL-SA-61392. Li Z., X. Cui, X. Zhang, Q. Wang, Y. Shao, and Y. Lin. 2009. "Pt/Carbon Nanofiber Nanocomposites as Electrocatalysts for Direct Methanol Fuel Cells: Prominent Effects of Carbon Nanofiber Nanostructures." Journal of Nanoscience and Nanotechnology 9, no. 4:2316-2323. PNNL-SA-53412. Lin Y., and H.S. Nalwa. 2009. Handbook of Electrochemical Nanotechnology. Stevenson Ranch, California:American Scientific Publishers. PNNL-SA-64696. Lin Y., and X. Cui. 2009. "Nanocarbon-Based Nanocatalysts: Synthesis and Applications in Fuel Cells." In Handbook of Electrochemical Nanotechnology, edited by Yuehe Lin and H.S. Nalwa. 145-164. Stevenson Ranch, California:American Scientific Publishers. PNNL-SA-48784. Lin Y., J. Wang, G. Liu, and C. Timchalk. 2009. "Portable Analytical Systems for On-Site Diagnosis of Exposure to Pesticides and Nerve Agents." In Nanoscience and Nanotechnology for Chemical and Biological Defense, ACS Sympoisum Series, edited by R. Nagarajan, W. Zukas, T. A. Hatton, S. Lee. 85-98. Dc:Oxford University Press. PNNL-SA-59141. Lin Y., W. Yantasee, F. Lu, J. Wang, M. Musameh, Y. Tu, and Z. Ren. 2009. "Biosensors Based on Carbon Nanotubes." In Dekker Encyclopedia of Nanoscience and Nanotechnology, edited by CI Contescu and K Putyera. 428-440. New York, New York:2nd ed. Taylor and Francis. PNNL-SA-94701. Lin Y., X. Ye, and C.M. Wai. 2009. "Nanostructured Materials: Symthesis in Supercritical Fluids." In Dekker Encyclopedia of Nanoscience and Nanotechnology, edited by CI Contescu and K Putyera. 3040-3051. New York, New York:2nd ed. Taylor and Francis. PNNL-SA-94703. Miao Y., H. Wang, Y. Shao, Z. Tang, J. Wang, and Y. Lin. 2009. "Layer-By-Layer Assembled Hybrid Film of Carbon Nanotubes/Iron Oxide Nanocrystals for Reagentless Electrochemical Detection of H2O2." Sensors and Actuators. B, Chemical 138, no. 1:182-188. PNNL-SA-61106. Shao Y., J. Wang, R. Kou, M.H. Engelhard, J. Liu, Y. Wang, and Y. Lin. 2009. "The Corrosion of PEM Fuel Cell Catalyst Supports and Its Implications for Developing Durable Catalysts." Electrochimica Acta 54. PNNL-SA-61042. Shao Y., R. Kou, J. Wang, C.M. Wang, V.V. Vishwanathan, J. Liu, and Y. Wang, et al. 2009. "The durability dependence of Pt/CNT electrocatalysts on the nanostructures of carbon nanotubes: hollow- and bamboo-CNTs." Journal of Nanoscience and Nanotechnology 9, no. 10:5811-5815. PNNL-SA-61618. Wang H., J. Wang, D. Choi, Z. Tang, H. Wu, and Y. Lin. 2009. "EQCM Immunoassay for Phosphorylated Acetylcholinesterase as a Biomarker for Organophosphate Exposures Based on Selective Zirconia Adsorption and Enzyme-Catalytic Precipitation." Biosensors and Bioelectronics 24, no. 8:2377-2383. PNNL-SA-62076. Wang J., and Y. Lin. 2009. "Nanomaterial-Based Biosensors for Detection of Pesticides and Explosives." In Nanotechnology Applications for Clean Water, edited by N. Savage, et al. 377-390. Nowich, New York:William Andrew. PNNL-SA-59139. Wang J., G. Liu, H. Wu, and Y. Lin. 2009. "Biosensors Based on Functionalized Carbon Nanotubes, Nanoparticles, and Nanowires." In Handbook of Electrochemical Nanotechnology, edited by Yuehe Lin and H. S. Nalwa. 95-111. Stevenson Ranch, California:American Scientific Publishers. PNNL-SA-48739. Ye S., F. Wu, X. Ye, and Y. Lin. 2009. "Supercritical Fluid Assisted Synthesis and Processing of Carbon Nanotubes." Journal of Nanoscience and Nanotechnology 9, no. 5:2781-2794. PNNL-SA-62064. Chen G., and Y. Lin. 2008. "Electrochemical Techniques." In Encyclopedia of Microfluidics and Nanofluidics, edited by D. Li. 469-474. New York, New York:Springer. PNNL-SA-61157. Lee A., G. Liu, C. Heng, S. Tan, T. Lim, and Y. Lin. 2008. "Sensitive electrochemical detection of horseradish peroxidase at disposable screen-printed carbon electrode." Electroanalysis 20, no. 18:2040-2046. PNNL-SA-61143. Lin Y., J. Wang, G. Liu, H. Wu, C.M. Wai, and Y. Lin. 2008. "A nanoparticle label/immunochromatographic electrochemical biosensor for rapid and sensitive detection of prostate-specific antigen." Biosensors and Bioelectronics 23, no. 11:1659-1665. PNNL-SA-57583. Lin Y., J. Wang, H. Wang, H. Wu, and Z. Tang. 2008. "Nanoparticles for Enhanced Sensitivity in Electrochemical Immunoassays." In Chemical Sensors 8: Chemical Sensors and Analytical Systems. ECS Transactions., edited by R. Mukundan, et al, 16, 477-482. Pennington, New Jersey:The Electrochemical Society. PNNL-SA-61565. Wang J., G. Liu, and Y. Lin. 2008. "Layer-by-Layer Assembly of Enzymes on Carbon Nanotubes." In Biomolecular Catalysis: Nanoscale Science and Technology, edited by J Kim, SH Kim, P Wang. 117-128. Washington Dc:American Chemical Society. PNNL-SA-53316. Wu H., M.H. Engelhard, J. Wang, D.R. Fisher, and Y. Lin. 2008. "Synthesis of Lutetium Phosphate/Apoferritin Core-Shell Nanoparticles for Potential Applications in Radioimmunoimaging and Radioimmunotherapy of Cancers." Journal of Materials Chemistry 18, no. 15:1779-1783. PNNL-SA-59270. Chen J., Y. Lin, and G. Chen. 2007. "Fabrication of Poly(methyl Methacrylate) microfluidic chips by redox-initiated polymerization." Electrophoresis 28, no. 16:2897-2903. PNNL-SA-56295. Liu G., J. Wang, Y. Lin, and J. Wang. 2007. "Nanoparticle-Based Biosensors and Bioassays." In Electrochemical Sensors, Biosensors and their Biomedical Applications, edited by X. Zhang, H. Ju, J. Wang. 441-457. Boston, Massachusetts:Academic Press. PNNL-SA-53318. Wang J., G. Liu, and Y. Lin. 2007. "Nanotubes, Nanowires, and Nanocantilevers in Biosensor Development." In Nanomaterials for Biosensors, Nanotechnologies for Life Sciences, edited by Challa S.S.R. Kumar. 56-100. Weinheim:Wiley-VCH. PNNL-SA-53317. Yantasee W., Y. Lin, and G.E. Fryxell. 2007. "Electrochemical sensors based on nanomaterials for environmental monitoring." In Environmental Applications of Nanomaterials: Synthesis, Sorbents And Sensors, edited by Glen E. Fryxell and Guozhong Cao. 401-438. London:Imperial College Press. PNNL-SA-52933. Yantasee W., Y. Lin, K. Hongsirikarn, G.E. Fryxell, R.S. Addleman, and C. Timchalk. 2007. "Electrochemical Sensors for the Detection of Lead and Other Toxic Heavy Metals: The Next Generation of Personal Exposure Biomonitors." Environmental Health Perspectives 115, no. 12:1683-1690. PNWD-SA-7728. Chen G., and Y. Lin. 2006. "Microfabricated Devices for Sample Extraction, Concentrations, and Related Sample Processing Technologies." In Bio-MEMS: Technologies and Applications, edited by W Wang and SA Soper. 213-236. Boca Raton, Florida:CRC Press. PNNL-SA-45839. Chen G., Y. Lin, and J. Wang. 2006. "Microchip Capillary Electrophoresis with Electrochemical Detection for Monitoring Environmental Pollutants." Current Analytical Chemistry 2, no. 1:43-50. PNNL-SA-45838. Chen G., Y. Lin, and J. Wang. 2006. "Monitoring environmental pollutants by microchip capillary electrophoresis with electrochemical detection." Talanta 68, no. 3:497-503. PNNL-SA-48560. Cui X., M.H. Engelhard, and Y. Lin. 2006. "Preparation, Characterization and Anion Exchange Properties of Polypyrrole/Carbon Nanotube Nanocomposite." Journal of Nanoscience and Nanotechnology 6, no. 2:547-553. PNNL-SA-47405. Jiang M., and Y. Lin. 2006. "Carbon Nanotube Based Sensors." In Encyclopedia of Sensors, edited by C. A. Grimes, E. C. Dickey, and M. V. Pishko. 25-51. Stevenson Ranch, California:American Scientific Publishers. PNNL-SA-47957. Lin Y., and X. Cui. 2006. "Electrosynthesis, Characterization, and Application of Novel Hybrid Materials Based on Carbon Nanotube-Polyaniline-Nickel Hexacyanoferrate Nanocomposites." Journal of Materials Chemistry 16, no. 6:585-592. PNNL-SA-47949. Lin Y., G. Liu, and J. Wang. 2006. "Biosensors Fabricated through Electrostatic Assembly of Enzymes/Polyelectrolyte Hybrid Layers on Carbon Nanotubes." In Nanotech 2006 Technical Proceedings of the 2006 NSTI Nanotechnology Conference and Trade Show 2006, edited by M. Laudon, B. Romanowicz, 2, 252-255. Cambridge, Massachusetts:Nano Science & Technology Institute. PNNL-SA-49689. Lin Y., X. Cui, J. Wang, C. Yen, and C.M. Wai. 2006. "Pt and Pt-Ru/Carbon Nanotube Nanocomposites Synthesized in Supercritical Fluid as Electrocatalysts for Low-Temperature Fuel Cells." In Nanotech 2006 Technical Proceedings of the 2006 NSTI Nanotechnology Conference and Trade Show, edited by M. Laudon, B. Romanowicz, 1, 524-527. Cambridge, Massachusetts:Nano Science & Technology Institute. PNNL-SA-49690. Liu G., and Y. Lin. 2006. "Amperometric Glucose Biosensor Based on Self-Assembling Glucose Oxidase on Carbon Nanotubes." Electrochemistry Communications 8. PNNL-SA-46971. Liu G., and Y. Lin. 2006. "Carbon Nanotube Templated Asembly of Protein." Journal of Nanoscience and Nanotechnology 6, no. 4:948-953. PNNL-SA-45518. Liu G., C. Timchalk, and Y. Lin. 2006. "Bioelectrochemical Magnetic Immunosensing of Trichloropyridinol: A Potential Insecticide Biomarker." Electroanalysis 18, no. 16:1605-1613. PNNL-SA-45459. Liu G., H. Wu, J. Wang, and Y. Lin. 2006. "Apoferritin Templated Synthesis of Metal Phosphate Nanoparticle Labels for Electrochemical Immunoassay." Small 2, no. 10:1139-1143. PNNL-SA-50139. Liu G., J. Wang, and Y. Lin. 2006. "Nanoparticle Labels/ Electrochemical Immunosensor for Detection of Biomarkers." In Nanotech 2006 Technical Proceedings of the 2006 NSTI Nanotechnology Conference and Trade Show, edited by M. Lauden, R. Romanowicz, 2, 192-195. Cambridge, Massachusetts:Nano Science & Technology Institute. PNNL-SA-49687. Wang J., D. Lu, S. Thongngamdee, Y. Lin, and O.A. Sadik. 2006. "Catalytic Adsorptive Stripping Voltammetric Measurements of Trace Vanadium at Bismuth Film Electrodes." Talanta 69, no. 4:914-917. PNNL-SA-47950. Wang J., G. Liu, and Y. Lin. 2006. "Electroactive Silica Nanoparticles for Biological Labeling." Small 2, no. 10:1134-1138. PNNL-SA-48261. Cui X., G. Liu, and Y. Lin. 2005. "Amperometric Biosensors Based on Carbon Paste Electrodes Modified with Nanostructured Mixed-valence Manganese Oxides and Glucose Oxidase." Nanomedicine 1, no. 2:130-135. PNNL-SA-44590. Cui X., G. Liu, and Y. Lin. 2005. "Biosensors Based on Carbon Nanotubes/Nickel Hexacyanoferrate/Glucose Oxidase Nanocomposites." Journal of Biomedical Nanotechnology 1, no. 3:320-327. PNNL-SA-45387. Deo R.P., J. Wang, I. Block, A. Mulchandani, K. Joshi, M. Trojanowicz, and F. Scholz, et al. 2005. "Determination of Organophosphate Pesticides at a Carbon Nanotube/Organophosphorus Hydrolase Electrochemical Biosensor." Analytica Chimica Acta 530, no. 2:185-189. PNNL-SA-43263. Fryxell G.E., Y. Lin, S.K. Fiskum, J.C. Birnbaum, H. Wu, K.M. Kemner, and S. Kelly. 2005. "Actinide Sequestration Using Self-Assembled Monolayers on Mesoporous Supports." Environmental Science & Technology 39, no. 5:1324-1331. PNNL-SA-42918. Lin L., N.S. Lawrence, S. Thongngamdee, J. Wang, and Y. Lin. 2005. "Catalytic Adsorptive Stripping Determination of Trace Chromium (VI) at Bismuth Film Electrodes." Talanta 65, no. 1:144-148. PNNL-SA-43108. Lin L., S. Thongngamdee, J. Wang, Y. Lin, O.A. Sadik, and S. Ly. 2005. "Adsorptive Stripping Voltammetric Measurements of Trace Uranium at the Bismuth Film Electrode." Analytica Chimica Acta 535, no. 1-2:9-13. PNNL-SA-43109. Lin Y., W. Yantasee, and J. Wang. 2005. "Carbon Nanotubes (CNTs) for the Development of Electrochemical Biosensors." Frontiers in Bioscience 10, no. 1:492-505. PNNL-SA-42390. Lin Y., X. Cui, and L. Li. 2005. "Low-potential Amperometric Determination of Hydrogen Peroxide with a Carbon Paste Electrode Modified with Nanostructured Cryptomelane-type Manganese Oxides." Electrochemistry Communications 7, no. 2:166-172. PNNL-SA-43689. Lin Y., X. Cui, and X. Ye. 2005. "Electrocatalytic Reactivity for Oxygen Reduction of Palladium-Modified Carbon Nanotubes Synthesized in Supercritical Fluid." Electrochemistry Communications 7, no. 3:267-274. PNNL-SA-43678. Lin Y., X. Cui, C. Yen, and C.M. Wai. 2005. "Platinum/Carbon Nanotube Nanocomposite Synthesized in Supercritical Fluid as Electrocatalysts for Low-Temperature Fuel Cells." Journal of Physical Chemistry B 109, no. 30:14410-14415. PNNL-SA-45327. Lin Y., X. Cui, C. Yen, and C.M. Wai. 2005. "PtRu/Carbon Nanotube Nanocomposite Synthesized in Supercritical Fluid: A Novel Electrocatalyst for Direct Methanol Fuel Cell." Langmuir 21, no. 24:11474-11479. PNNL-SA-45564. Liu G., and Y. Lin. 2005. "A Renewable Electrochemical Magnetic Immunosensor Based on Gold Nanoparticle Labels." Journal of Nanoscience and Nanotechnology 5, no. 7:1060-1065. PNNL-SA-44859. Liu G., and Y. Lin. 2005. "Electrochemical Sensor for Organophosphate Pesticides and Nerve Agents Using Zirconia Nanoparticles as Selective Sorbents." Analytical Chemistry 77, no. 18:5894-5901. PNNL-SA-45242. Liu G., and Y. Lin. 2005. "Electrochemical Stripping Analysis of Organophosphate Pesticides and Nerve Agents." Electrochemistry Communications 7, no. 4:339-343. PNNL-SA-43939. Liu G., S.L. Riechers, C. Timchalk, and Y. Lin. 2005. "Sequential Injection/Electrochemical Immunoassay for Quantifying the Pesticide Metabolite 3, 5, 6-Trichloro-2-Pyridinol." Electrochemistry Communications 7, no. 12:1463-1470. PNNL-SA-46972. Liu G., S.L. Riechers, M.C. Mellen, and Y. Lin. 2005. "Sensitive Electrochemical Detection of Enzymatically-generated Thiocholine at Carbon Nanotube Modified Glassy Carbon Electrode." Electrochemistry Communications 7, no. 11:1163-1169. PNNL-SA-46422. Lu F., K. Wang, and Y. Lin. 2005. "Rapid, quantitative and sensitive immunochromatographic assay based on stripping voltammetric detection of a metal ion label." Analyst 130, no. 11:1513-1517. PNNL-SA-45517. Mattigod S.V., G.E. Fryxell, K.E. Parker, and Y. Lin. 2005. "Application of Novel Nanoporous Sorbents for the Removal of Heavy Metals, Metalloids, and Radionuclides." In Trace Elements in the Environment, edited by MNV Prasad, KS Sajwan, R Naidu. 369-380. Boca Raton, Florida:Taylor and Francis. PNNL-SA-47070. Tu Y., Y. Lin, W. Yantasee, and Z. Ren. 2005. "Carbon Nanotubes Based Nanoelectrode Arrays: Fabrication, Evaluation and Application in Voltammetric Analysis." Electroanalysis 17, no. 1:79-84. PNNL-SA-39109. Wang L., J. Luo, M.M. Maye, Q. Fan, Q. Rendeng, J. Wang, and M.H. Engelhard, et al. 2005. "Synthesis and Characterization of Magnetic Iron Oxide Nanoparticles." In Fabrication and New Applications of Nanomagnetic Structures, MRS Proceedings, edited by J-P. Wang, P.J. Ryan, K. Nielsch, Z. Cheng, 853E. Warrendale, Pennsylvania:Materials Research Society. PNNL-SA-45190. Wang L., J. Luo, M.M. Maye, Q. Fan, R. Qiang, M.H. Engelhard, and C.M. Wang, et al. 2005. "Iron Oxide-Gold Core-Shell Nanoparticles and Thin-Film Assembly." Journal of Materials Chemistry 15, no. 18:1821-1832. PNNL-SA-45191. Wang L.Y., J. Luo, Q. Fan, M. Suzuki, I.S. Suzuki, M.H. Engelhard, and Y. Lin, et al. 2005. "Monodispersed core-shell Fe3O4@Au nanoparticles." Journal of Physical Chemistry B 109, no. 46:21593-21601. PNNL-SA-47794. Yantasee W., C. Timchalk, G.E. Fryxell, B.P. Dockendorff, and Y. Lin. 2005. "Automated portable analyzer for lead(II) based on sequential flow injection and nanostructured electrochemical sensors." Talanta 68, no. 2:256-261. PNNL-SA-45434. Yantasee W., C. Timchalk, K.K. Weitz, D.A. Moore, and Y. Lin. 2005. "Optimization of A Portable Microanalytical System to Reduce Electrode Fouling from Proteins Associated with Biomonitoring of Lead (Pb) in Saliva." Talanta 67, no. 3:617-624. PNWD-SA-6834. Yantasee W., G.E. Fryxell, M.M. Conner, and Y. Lin. 2005. "Nanostructured Electrochemical Sensors Based on Functionalized Nanoporous Silica for Voltammetric Analysis of Lead, Mercury and Copper." Journal of Nanoscience and Nanotechnology 5, no. 9:1537-1540. PNNL-SA-44507. Ye X., C.M. Wai, Y. Lin, J.S. Young, and M.H. Engelhard. 2005. "Supercritical Fluid Immersion Deposition: A New Process for Selective Deposition of Metal Films on Silicon Substrates." Surface & Coatings Technology 190, no. 1:25-31. PNNL-SA-38839. Fryxell G.E., R.S. Addleman, S.V. Mattigod, Y. Lin, T.S. Zemanian, H. Wu, and J.C. Birnbaum, et al. 2004. "Environmental and Sensing Applications of Molecular Self-Assembly." In Dekker Encyclopedia of Nanoscience and Nanotechnology, edited by J. A. Schwarz, C. Contescu, K. Putyera. 1135-1145. New York:Marcel Dekker. PNNL-SA-38029. Han L., W. Wu, F. Kirk, J. Luo, M.M. Maye, N.N. Kariuki, and Y. Lin, et al. 2004. "A Direct Route towards Assembly of Nanoparticle-Carbon Nanotube Composite Materials." Langmuir 20, no. 14:6019-6025. PNNL-SA-39379. Kariuki N.N., J. Luo, L. Han, M.M. Maye, L. Moussa, M. Patterson, and Y. Lin, et al. 2004. "Nanoparticle-Structured Ligand Framework as Electrode Interfaces." Electroanalysis 16, no. 1-2:120-126. PNNL-SA-39108. Kariuki N.N., J. Luo, M.M. Maye, S.A. Hassan, T. Menard, H.R. Naslund, and Y. Lin, et al. 2004. "Composition-Controlled Synthesis of Bimetallic Gold-Silver Nanoparticles." Langmuir 20, no. 25:11240-11246. PNNL-SA-43470. Lin Y., F. Lu, and J. Wang. 2004. "Disposable Carbon Nanotube Modified Screen-Printed Biosensor for Amperometric Detection of Organophosphorus Pesticides and Nerve Agents." Electroanalysis 16, no. 1-2:145-149. PNNL-SA-39107. Lin Y., F. Lu, Y. Tu, and Z. Ren. 2004. "Glucose Biosensors Based on Carbon Nanotube Nanoelectrode Ensembles." Nano Letters 4, no. 2:191-195. PNNL-SA-39464. Lin Y., W. Yantasee, and G.E. Fryxell. 2004. "Electrochemical Sensors Based on Functionalized Nanoporous Silica." In Dekker Encyclopedia of Nanoscience and Nanotechnology, edited by J. A. Schwarz, C. Contescu, K. Putyera. 1051-1061. New York:Marcel Dekker. PNWD-SA-6088. Lin Y., W. Yantasee, F. Lu, J. Wang, M. Musameh, Y. Tu, and Z. Ren. 2004. "Biosensors Based on Carbon Nanotubes." In Dekker Encyclopedia of Nanoscience and Nanotechnology, edited by J. A. Schwarz, C. Contescu, K. Putyera. 361-374. New York:Marcel Dekker. PNNL-SA-39111. Lin Y., W. Yantasee, G.E. Fryxell, and M.M. Conner. 2004. "Electrochemical Sensors Based on Functionalized Nanoporous Silica for Environmental Monitoring." In Nanosensing: Materials and Devices. Proceedings of SPIE, edited by M. S. Islam and A. K. Dutta, 5593, 554-560. Bellingham, Washington:International Society for Optical Engineering. PNNL-SA-43265. Lin Y., W. Yantasee, G.E. Fryxell, Z. Wang, and J. Wang. 2004. DOE-EMSP Project Report FY 04: Portable Analyzer Based on Microfluidics/Nanoengineered Electrochemical Sensors for In-situ Characterization of Mixed Wastes. PNNL-14924 FY 04. Richland, WA: Pacific Northwest National Laboratory. Lin Y., X. Ye, and C.M. Wai. 2004. "Nanostructured Materials Synthesized In Supercritical Fluid." In Dekker Encyclopedia of Nanoscience and Nanotechnology, edited by J. A. Schwarz, C. Contescu, K. Putyera. 2595-2607. New York:Marcel Dekker. PNNL-SA-39110. Lin Y., Y. Tu, F. Lu, and Z. Ren. 2004. "Development of Biosensors Based on Carbon Nanotube Nanoelectrode Arrays." In Nanosensing: Materials and Devices. Proceedings of SPIE, edited by M.S. Islam and A.K. Dutta, 5593, 44-51. Bellingham, Washington:International Society for Optical Engineering. PNNL-SA-43264. Lin Y., Y. Tu, F. Lu, W. Yantasee, and Z. Ren. 2004. "Carbon Nanotubes Based Nanoelectrode Arrays: Fabrication, Evaluation, and Sensing Applications." In Chemical Sensors VI: Chemical and Biological Sensors and Analytical Methods. Proceedings of the International Symposium. Proceedings Electrochemical Society, edited by C. Bruckner-Lea, P. Vantsek, G. Hunter, E. Egashira, N. Miur, 2004-08, 399-409. Pennington, New Jersey:The Electrochemical Society. PNNL-SA-42565. Luo J., M.M. Maye, L. Han, N.N. Kariuki, V.W. Jones, Y. Lin, and M.H. Engelhard, et al. 2004. "Spectroscopic Characterizations of Molecularly-Linked Gold Nanoparticle Assemblies Upon Thermal Treatment." Langmuir 20, no. 10:4254-4260. PNNL-SA-40712. Timchalk C., T.S. Poet, A.A. Kousba, J.A. Campbell, and Y. Lin. 2004. "Noninvasive Biomonitoring Approaches to Determine Dosimetry and Risk Following Acute Chemical Exposure: Analysis of Lead or Organophosphate Insecticide in Saliva." Journal of Toxicology and Environmental Health Part A 67. PNWD-SA-6071. Yantasee W., Y. Lin, G.E. Fryxell, and B.J. Busche. 2004. "Simultaneous Detection of Cadmium, Copper, and Lead using A Carbon Paste Electrode Modified with Carbamoylphosphonic Acid Self-Assembled Monolayer on Mesoporous Silica (SAMMS)." Analytica Chimica Acta 502, no. 2:207-212. PNNL-SA-39324. Yantasee W., Y. Lin, G.E. Fryxell, and Z. Wang. 2004. "Carbon Paste Electrode Modified with Carbamoylphosphonic Acid Functionalized Mesoporous Silica: A New Mercury-Free Sensor for Uranium Detection." Electroanalysis 16, no. 10:870-873. PNNL-SA-38548. Yantasee W., Y. Lin, G.E. Fryxell, K.L. Alford, B.J. Busche, and C.D. Johnson. 2004. "Selective Removal of Copper(II) from Aqueous Solutions Using Fine-Grained Activated Carbon Functionalized with Amine." Industrial and Engineering Chemistry Research 43, no. 11:2759-2764. PNNL-SA-38034. Yantasee W., Y. Lin, K.L. Alford, B.J. Busche, G.E. Fryxell, and M.H. Engelhard. 2004. "Electrophilic Aromatic Substitutions of Amine and Sulfonate onto Fine-Grained Activated Carbon for Aqueous-Phase Metal Ion Removal." Separation Science and Technology 39, no. 14:3263-3279. PNNL-SA-38033. Ye X., H. Zhang, Y. Lin, L.S. Wang, and C.M. Wai. 2004. "Modification of SiO2 Nanowires with Metallic Nanocrystals from Supercritical CO2." Journal of Nanoscience and Nanotechnology 4, no. 1/2:82-85. PNNL-SA-38841. Ye X., Y. Lin, C.M. Wang, M.H. Engelhard, Y. Wang, and C.M. Wai. 2004. "Supercritical Fluid Synthesis and Characterization of Catalytic Metal Nanoparticles on Carbon Nanotubes." Journal of Materials Chemistry 14, no. 5:908-913. PNNL-SA-40131. Lin Y., and N.G. Smart. 2003. "Supercritical Fluid Extraction of Actinides and Heavy Metals for Environmental Cleanup: A Process Development Perspective." In Supercritical Carbon Dioxide: Separations and Processes, ACS Symposium Series, edited by A. S. Gopalan, C. M. Wai, and H. K. Jacobs. 23-35. Washington Dc:American Chemical Society. PNNL-SA-37826. Lin Y., C. Liu, H. Wu, H.K. Yak, and C.M. Wai. 2003. "Supercritical Fluid Extraction of Toxic Heavy Metals and Uranium from Acidic Solutions with Sulfur-Containing Organophosphorus Reagents." Industrial and Engineering Chemistry Research 42, no. 7:1400-1405. PNNL-SA-37937. Lin Y., G. Collins, and J. Wang. 2003. SERDP Project Final Report: Integrated Automated Analyzer for Monitoring of Explosives in Groundwater. PNNL-14463. Richland, WA: Pacific Northwest National Laboratory. Liu J., Y. Lin, L. Liang, J.A. Voigt, D.L. Huber, Z. Tian, and E. Coker, et al. 2003. "Templateless Assembly of Molecularly Aligned Conductive Polymers Nanowires: A New Approach for Oriented Nanostructures." Chemistry - A European Journal 9, no. 3:604-611. PNNL-SA-37104. Maye M.M., J. Luo, W. Chan, L. Han, N.N. Kariuki, H.R. Naslund, and M.H. Engelhard, et al. 2003. "Characterizations of Core-Shell Nanoparticle Catalysts for Methanol Electrooxidation." In Solid-State Ionics, Materials Research Society Symposium Proceedings, edited by P. Knauth, J-M. Tarascon, E. Traversa, H.L. Tulle, 756, FF6.2.1-6.2.6. Warrendale, Pennsylvania:Material Research Society. PNNL-SA-38509. Maye M.M., J. Luo, Y. Lin, M.H. Engelhard, M. Hepel, and C. Zhong. 2003. "X-Ray Photoelectron Spectroscopic Study of the Activation of Molecularly-Linked Gold Nanoparticle Catalysts." Langmuir 19, no. 1:125-131. PNNL-SA-37050. Wang J., M. Musameh, and Y. Lin. 2003. "Solubilization of Carbon Nanotubes by Nafion Toward the Preparation of Amperometric Biosensors." Journal of the American Chemical Society 125, no. 9:2408-2409. PNNL-SA-37935. Wang S., Y. Lin, and C.M. Wai. 2003. "SUPERCRITICAL FLUID EXTRACTION OF TOXIC HEAVY METALS FROM SOLID AND AQUEOUS MATRICES." Separation Science and Technology 38, no. 10:2279-2289. PNNL-SA-37936. Yantasee W., Y. Lin, G.E. Fryxell, B.J. Busche, and J.C. Birnbaum. 2003. "Removal of Heavy Metals from Aqueous Solution Using Novel Nanoengineered Sorbents: Self-Assembled Carbamoylphosphonic Acids on Mesoporous Silica." Separation Science and Technology 38, no. 15:3809-3825. PNNL-SA-38412. Yantasee W., Y. Lin, T.S. Zemanian, and G.E. Fryxell. 2003. "Voltammetric detection of lead (II) and mercury (II) using a carbon paste electrode modified with thiol self-assembled monolayer on mesoporous silica (SAMMS)." Analyst 128, no. 5:467-472. PNNL-SA-37939. Yantasee W., Y. Lin, X.S. Li, G.E. Fryxell, T.S. Zemanian, and V.V. Viswanathan. 2003. "Nanoengineered Electrochemical Sensor Based on Mesoporous Silica Thin-film Functionalized with Thiol-Terminated Monolayer." Analyst 128, no. 7:899-904. PNNL-SA-38216. Ye X., C.M. Wai, D. Zhang, Y. Kranov, D. Mcilroy, D. Mcilroy, and Y. Lin, et al. 2003. "Immersion Deposition of Metal Films on Silicon and Germanium Substrates in Supercritical Carbon Dioxide." Chemistry of Materials 15, no. 1:83-91. PNNL-SA-35470. Ye X., Y. Lin, and C.M. Wai. 2003. "Decorating catalytic palladium nanoparticles on carbon nanotubes in supercritical carbon dioxide." Chemical Communications. PNNL-SA-37934. Ye X., Y. Lin, C.M. Wang, and C.M. Wai. 2003. "Supercritical Fluid Fabrication of Metal Nanowires and Nanorods Templated by Multi-walled Carbon Nanotubes." Advanced Materials 15, no. 4:316-319. PNNL-SA-37938. Yi T., Y. Lin, and Z. Ren. 2003. "Nanoelectrode Arrays Based on Low Site Density Aligned Carbon Nanotubes." Nano Letters 3, no. 1:107-109. PNNL-SA-37831. Zemanian T.S., G.E. Fryxell, O.A. Ustyugov, J.C. Birnbaum, and Y. Lin. 2003. "Synthesis of Nanostructured Sorbent Materials Using Supercritical Fluids." In Supercritical Carbon Dioxide-Separations and Processes, ACS Symposium Series, edited by A. S. Gopalan, C. M. Wai, and H. K. Jacobs. 370-386. Washington Dc:Oxford University Press. PNNL-SA-43558. Fryxell G.E., Y. Lin, H. Wu, and K.M. Kemmer. 2002. "Environmental Applications of Self-assembled Monolayers on Mesoporous Supports (SAMMS)." In Nanoporous Materials III, Studies in Surface Science and Catalysis, edited by A. Sayari and M. Jaroniec, 141, 583-590. Amsterdam:Elsevier. PNNL-SA-45566. Liang L., J. Liu, C.F. Windisch, G.J. Exarhos, and Y. Lin. 2002. "Direct Assembly of Large Arrays of Oriented Conducting Polymer Nanowires." Angewandte Chemie International Edition 41, no. 19:3665-3668. PNNL-SA-37103. Lin Y., K. Tang, and R.D. Smith. 2002. "Laser-Machined Microdevices for Mass Spectrometry." In Mass Spectrometry and Hyphenated Techniques in Neuropeptide Research, edited by J. Silberring and R. Ekman. 171-192. Wiley Interscience, New York:John Wiley & Sons. PNNL-SA-35813. Musameh M., J. Wang, A. Merkoci, and Y. Lin. 2002. "Low-Potential Stable NADH Detection at Carbon-Nanotube-Modified Glassy Carbon Electrodes." Electrochemistry Communications 4. PNNL-SA-37105. Wang J., M. Pumera, M.P. Chatrathi, A. Escarpa, M. Musameh, G.E. Collins, and A. Mulchandani, et al. 2002. "Single-Channel Microchip for Fast Screening and Detailed Identification of Nitroaromatic Explosives and Organophosphate Nerve Agents." Analytical Chemistry 74. PNNL-SA-35471. Elshani S., N.G. Smart, Y. Lin, and C.M. Wai. 2001. "Application of Supercritical Fluids to the Reactive Extraction and Analysis of Toxic Heavy Metals from Environmental Matrices - System Optimisation." Separation Science and Technology 36, no. 5-6:1197-1210. PNNL-SA-35043. Lin Y., C. Timchalk, D.W. Matson, H. Wu, and K.D. Thrall. 2001. "Integrated Microfluidics/Electrochemical Sensor System for Monitoring of Environmental Exposures to Lead and Chlorophenols." Biomedical Microdevices 3, no. 4:331-338. PNNL-SA-33862. Lin Y., G.E. Fryxell, H. Wu, and M.H. Engelhard. 2001. "Selective Sorption of Cesium Using Self-Assembled Monolayers on Mesoporous Supports." Environmental Science & Technology 35, no. 19:3962-3966. PNNL-SA-34957. Lin Y., H. Wu, N.G. Smart, and C.M. Wai. 2001. "Studies on In-situ Chelation/Supercritical Fluid Extraction of Lanthanides and Actinides Using a Radiotracer Technique." Separation Science and Technology 36, no. 5 & 6:1149-1162. PNNL-SA-32515. Tang K., Y. Lin, D.W. Matson, T. Kim, and R.D. Smith. 2001. "Generation of Multiple Electrosprays Using Microfabricated Emitter Arrays for Improved Mass Spectrometric Sensitivity." Analytical Chemistry 73, no. 8:1658-1663. PNNL-SA-34087. Timchalk C., T.S. Poet, Y. Lin, K.K. Weitz, R. Zhao, and K.D. Thrall. 2001. "Development of an Integrated Micro-Analytical System for Lead in Saliva and Linkage to a Physiologically Based Pharmacokinetic Model Describing Lead Saliva Secretion." American Industrial Hygiene Association Journal 62, no. 3:295-302. PNNL-SA-32610. Fryxell G.E., J. Liu, S.V. Mattigod, L.Q. Wang, Y. Lin, X. Feng, and T.A. Hauser, et al. 2000. "Environmental Applications of Interfacially Modified Mesoporous Ceramics." In Environmental Issues and Waste Management Technologies in the Ceramic and Nuclear Industries V, edited by G. T. Chandler and X. Feng, 107, 29-37. Westerville, Ohio:American Ceramic Society. PNNL-SA-45567. Lin Y., D.W. Matson, D.E. Kurath, J.Y. Wen, F. Xiang, W.D. Bennett, and P.M. Martin, et al. 2000. "Microfluidic Devices on Polymer Substrates for Bioanalytical Applications." In 3rd International Conference on Microreaction Technology; Microreaction Technology: Industrial Prospects IMRET 3, April 1999., 451-460. New York, New York:Springer. PNNL-SA-31717. Lin Y., D.W. Matson, W.D. Bennett, K.D. Thrall, and C. Timchalk. 2000. "Integrated Microfluidics/Electrochemical Sensor System for Field-Monitoring of Toxic Metals." In Microreaction technology: industrial prospects: IMRET 3 : proceedings of the Third International Conference on Microreaction Technology, edited by W. Ehrfeld, 588-596. Berlin:Springer. PNNL-SA-45661. Lin Y., H. Wu, C.M. Wai, and N.G. Smart. 2000. "Separation of Divalent Transition Metal Beta-Diketonates and Their Adducts By Supercritical Fluid Chromatography." Talanta 52, no. 4:695-701. PNNL-SA-32516. Wen J.Y., Y. Lin, F. Xiang, D.W. Matson, H.R. Udseth, and R.D. Smith. 2000. "Microfabricated Isoelectric Focusing Devices for Direct Electrospray Ionization-Mass Spectrometry." Electrophoresis 21, no. 1:191-197. PNNL-SA-31322. Yantasee W., Y. Lin, K. Hongsirikarn, G.E. Fryxell, S. Addleman, and C. Timchalk. 2000. "Electrochemical Sensors for the Detection and Quantification of Lead and Other Toxic Heavy Metals: The Next Generation of Personal Exposure Biomonitors." Environmental Health Perspectives 115, no. 12:1683-1690. PNWD-SA-7818. Lin Y., J.Y. Wen, X. Fan, D.W. Matson, and R.D. Smith. 1999. "Laser Micromachined Isoelectric Focusing Device on Polymer Substrate for Electrospray Mass Spectrometry." In Proceedings of SPIE. Microfluidic Devices and Systems II: September 20-21, 1999, Santa Clara, California, edited by C.H. Ahn and A.B. Frazier, 3877, 28-35. Bellingham, Washington:SPIE. PNNL-SA-31483. Lin Y., R. Zhao, K.D. Thrall, C. Timchalk, W.D. Bennett, and D.W. Matson. 1999. "Integration of Microfluidics/Electrochemical System for Trace Metal Analysis by Stripping Voltammetry." In Proceedings of SPIE. Microfludic Devices and Systems II: September 20-21, 1999, Santa Clara, California, edited by C.H. Ahn and A.B. Frazier, 3877, 248-256. Bellingham, Washington:SPIE. PNNL-SA-31482. Martin P.M., D.W. Matson, W.D. Bennett, D.C. Stewart, and Y. Lin. 1999. "Laser-Micromachined and Laminated Microfluidic Components for Miniaturized Thermal, Chemical and Biological Systems." In Design, Test, and Microfabrication of MEMS and MOEMS. Proceedings of SPIE., 3680, 826-833. Bellingham,, :SPIE?The International Society for Optical Engineering. PNNL-SA-30686. Martin P.M., D.W. Matson, W.D. Bennett, Y. Lin, and D.J. Hammerstrom. 1999. "Laminated Plastic Microfluidic Components for Biological and Chemical Systems." Journal of Vacuum Science and Technology A--Vacuum, Surfaces and Films 17, no. 4:2264-2269. PNNL-SA-30444. Xiang F., Y. Lin, J.Y. Wen, D.W. Matson, and R.D. Smith. 1999. "An Integrated Microfabricated Device for Dual Microdialysis and On-line ESI Ion Trap Mass Spectrometry for the Analysis of Complex Biological Samples." Analytical Chemistry 71, no. 8:1485-1490. PNNL-SA-30690. Lin Y., N. Xu, J.Y. Wen, D.W. Matson, and R.D. Smith. 1998. "Micro fabricated Dual-Microdialysis and Capillary, Isoelectric Focusing Devices for Cleanup and Separations/Mass Spectrometric Analysis of Biomolecules." In Micro Total Analysis Systems '98; proceedings of the (mu)TAS '98 Workshop, held in Banff, Canada, 13-16 October 1998, edited by D.J. Harrison and A.V. den Berg, 343-346. Boston, Massachusetts:Kluwer Academic Publishers. PNNL-SA-32258. Matson D.W., P.M. Martin, W.D. Bennett, D.E. Kurath, Y. Lin, and D.J. Hammerstrom. 1998. "Fabrication Processes for Polymer-Based Microfluidic Analytical Devices." In Micro total analysis systems '98: proceedings of the [Mu] TAS '98 Workshop, held in Banff, Canada, 13-16 October 1998, edited by DJ Harrison & A Van den Berg, 371-374. Dordrecht:Kluwer Academic. PNNL-SA-30104.